Want to grow your own vegetables or even some fish for food? You don’t need to have an enormous space to make it happen with this PVC aquaponic system! This aquaponic system is very efficient and makes producing your own food possible and even easier. By growing vertically, you can produce twice as much produce as you can grow using a standard single level hydroponic system of the same area. 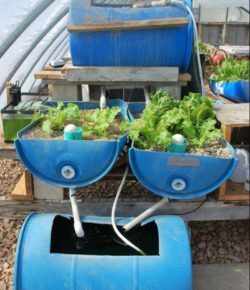 This system makes use of fish waste as fertilizer. Using a small pump, water from the fish tank is drawn up to water the crops through the tops of the columns. You don’t need any other fertilizer or pesticides with this system. Less water is also consumed as compared to a soil garden. If you build this aquaponic system right, you won’t even have to clean the fish tank too often. All you have to think about regularly is replacing lost water and of course, feeding the fish. Do you want to grow your own produce? Follow this tutorial by Engineering for Change to see how easy it is to build one! 1 PC Air Pump (optional). The system can aerate itself but it can produce more if it has an air pump. Cut the pipe into six 1ft. sections for the sides and two 14in. sections for the ends. Drill two 3in-diameter holes in each of the 1ft side pieces. Drill a 1in-diameter hole into the side of one of the end pieces. Tip: You can use any kind of durable plastic or pipe, not just what’s pictured. Cut the vertical pipes to whatever length you like. The ones pictured are cut at different lengths, from 2ft to 4ft, to show what they each look like. But you would usually cut all four to the same length. Drill 1-in diameter holes in the vertical pipes, evenly spaced. Insert the vertical pipes as shown. The photo on the right shows the finished system to give an idea of what you’re building. Perforate the bottoms of the plastic cups and place them in the holes you drilled in the side pipes. Cut a piece of 1in-diameter pipe to insert into the 1-in hole in the end pipe to make a drain. The drain should pour into one of the 50-gallon drums. Adjust the structure’s balance and support its joints with wooden boards. You could tilt the structure slightly toward the drainpipe to improve the water flow. Cut strips of burlap (or another material), fasten them to the tops of the vertical pipes and drape them down the inside of the pipes. This gives the plant roots something to latch onto. These systems can scale up to commercial size, like this greenhouse at the Center for Sustainable Aquaponics. This arrangement shows some of the creativity and beauty possible with an aquaponic system. There is a rocky waterfall into the fish tank and a drip-irrigation system watering soil-free plants in a rock bed. Sean Brady shows what these systems can produce. He’s holding a trout here. Thanks to Engineering for Change for this great project!